Four leading environmental groups welcome a decision by the EU Fisheries Council on trade restrictions for Illegal, Unreported and Unregulated (IUU) fishing. Brussels, Belgium: Today, four leading environmental groups – Environmental Justice Foundation (EJF), Oceana, The Pew Charitable Trusts and WWF have welcomed a decision by the EU Fisheries Council to place trade restrictions on Belize, Cambodia, and Guinea for failing to cooperate in fighting Illegal, Unreported and Unregulated (IUU) fishing. 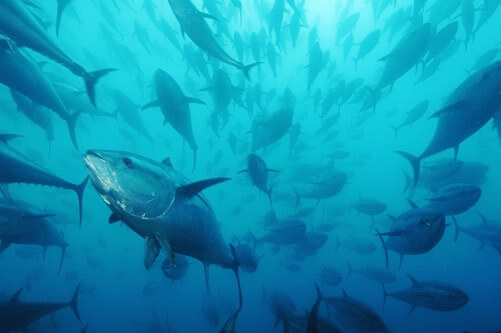 The decision means EU member states are now required to ban the import of fish from Belize, Cambodia, and Guinea and ensure that EU fishing vessels do not operate in the waters of these nations. In addition to welcoming the ban’s approval by the EU’s 28 fisheries ministers, and praising the Commissioner for Maritime Affairs and Fisheries, Maria Damanaki, for her leadership, the NGOs are calling for greater transparency in the way the EU evaluates third countries’ efforts to fight illegal fishing. They are also calling on the European Commission to close a loophole that allows non-EU vessels fishing in the banned countries’ waters to continue exporting their catches to the EU, and to work with EU member states to strengthen efforts to keep illegally-caught fish off the dinner plates of European consumers. The three countries were initially amongst eight countries identified by the European Commission in November 2012 for inadequate monitoring of their fishing fleets, neglecting to impose sanctions on illegal fishing operators, and failing to develop robust fisheries laws. In 2013 the Commission announced that Fiji, Panama, Sri Lanka, Togo, and Vanuatu had improved but that Belize, Cambodia and Guinea had not. Today’s Council decision confirms the Commission recommendation that the countries be formally blacklisted or “red-carded” and prevented from trading fish with the EU. IUU fishing depletes fish stocks, damages marine ecosystems, puts legitimate fishers at an unfair disadvantage and jeopardises the livelihoods of some of the world’s most vulnerable communities. IUU fishing is estimated to cost between 7 and 17 billion euro annually, representing 11 to 26 million tonnes of catch. The EU IUU Regulation aims to deprive market access for illegal fish, by requiring “catch certificates” for imports into the EU, as well as banning the entry of fish from countries and vessels involved in illegal fishing. A second round of “yellow cards” was issued by the European Commission in November 2013, with Curaçao, Ghana, and South Korea warned that they could also face the same set of trade measures if they do not cooperate in fighting IUU fishing. South Korean vessels have been widely documented fishing illegally in West Africa, causing significant impacts on coastal fishing communities and the marine environment. The organisations are calling on the EU to continue to show the same determination and resoluteness towards other countries that repeatedly fail to observe the rules. “The EU's efforts to tackle IUU fishing worldwide have truly materialised today with this unprecedented step. We hope that fishing nations around the world are looking today at the EU's leadership, and are ready to follow this newly opened path towards the definitive elimination of IUU fishing." Bluefin tuna stock in the Mediterranean is threatened by overfishing and illegal fishing.